Sterling Silver 925 Diamond cut Cable Chain, 3.3 mm. 1 meter approx. 26.1 gr. ..
Sterling Silver 925 Extra Heavy Cable Chain 11mm x 14.8mm, wire 2.9mm. 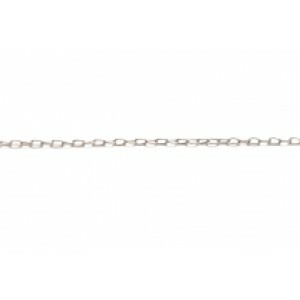 *LIMITED STOCK*..
Sterling Silver 925 Flat Link Oval Cable Chain, link 10.5mm x 7mm, thickness 0.75mm. 1 meter app..
Sterling Silver 925 Oval Cable Chain, 1.6 x 3.5mm, wire 0.3mm..
Sterling Silver 925 Round Wire Oval Cable Chain, 10 x 7 mm, wire thickness 1.1mm. 1 meter approx..
Sterling Silver 925 Square Wire Round Link Cable Chain, 5.9 mm, 0.5 wire. 1 meter approx. 12.7 g..